The latest pokies release from leading digital entertainment company, Net Entertainment, Tornado: Farm Escape is an exciting example of what NetEnt has in store for online gamblers in 2015. This vibrant online pokies game combines lively animation with huge bonus potential, especially in the form of Wild symbols. Newly released at the end of January 2015, Tornado: Farm Escape can already be found at our favourite NetEnt casinos, as recommended in our casino table above. If you’re new to any of these sites, take advantage of wicked welcome bonuses to get the most out of your game time. Each of our recommended online casinos also offer Tornado: Farm Escape for free play in practice mode with no registration required, so you can get a feel for the game before deciding whether you’re ready to play for money. These reputable gambling sites allow free play in practice mode as well as real money bets using AUD with secure payment methods that include MasterCard, Visa, direct bank transfer, Paysafecard, Neteller, Skrill and ecoPayz. Tornado: Farm Escape is a light hearted take on a farm yard hit by a devastating tornado, where the effects are anything but upsetting. Instead the animals see the tornado as their escape from their overbearing farmer, and use the intro of the game to jump into the storm with glee. The kooky animals then adorn the reels with great joy, spinning around the screen in playful abandonment, happy to have been relieved from their days work. The result is a bright, entertaining pokies game that provides hours of fun with the possibility of big wins when playing for real money. The game uses a five-reel, three-row, 20-pay line format and consists of such animal symbols as cows, horses, pigs, sheep and chicken along with other misplaced household items like appliances, furniture and clothing. The theoretic payout percentage of Tornado: Farm Escape is 96.5%. Real money bets can be placed for as little as 20 cents, with a maximum bet of $200. 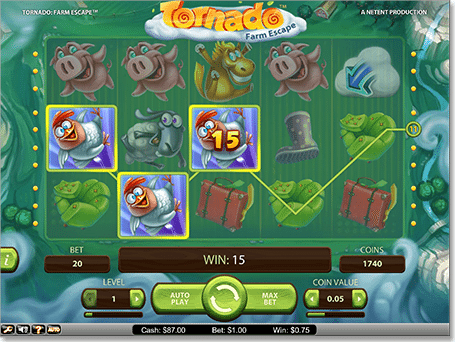 There’s a good range of betting choices in Tornado: Farm Escape, with options to bet between one and 10 credits per line. Wins are formed when identical symbols appear from left to right and during any of the games special bonus features. The games wild is the TV symbol which can be substituted for everything except the Hot and Cold Cloud symbols (clouds with either a blue or red arrow in them). The wild symbol can appear anywhere across the reels during the main game or bonus rounds. Storm Bonus – you’ll know straight away when you have triggered this bonus as the reels delightfully start exploding in bursts of thunder. This bonus feature can appear randomly at any time, in the form of a storm cloud symbol that moves one position at a time across the reels, changing at least one symbol into the wild (TV) symbol. The storm symbol moves across the screen with the potential to change several symbols into wilds. Winnings are revealed once the storm subsides and the symbol disappears. The storm bonus cannot be triggered during the Tornado bonus feature. Tornado Bonus – technically speaking, the Tornado feature is a free spins bonus, but it’s not like the free spins you’re used to coming across in online pokies. It isn’t easy to land this feature, but is definitely worth the wait. The Tornado bonus is triggered when a Hot cloud symbol (cloud with red arrow) appears anywhere on the first reel, and the Cold cloud symbol (cloud with blue arrow) appears anywhere on the last reel. Triggering this turns the wild symbol along with whatever symbol appears on the second row of the centre reel into the “active” symbol of the bonus feature. As the free spins start, an appearance of the active symbol or the wild anywhere across the reels results in a win. Free spins will continue until neither the active symbol nor the wild appear after a spin, which is when the Tornado bonus ends. Winnings are determined based on the type of symbol and the amount of times it appeared. Firstly, you’ve gotta love anything that can take a serious natural disaster like a tornado and turn it into a light-hearted and hilarious animated video slot game. NetEnt never fall short on innovative game ideas and Tornado: Farm Escape is certainly no exception. This game is an instant favourite due to its cheerful demeanor and fun bonus features that are as exciting to watch unfold whether you are playing for real money or not. During our testing, the Storm Bonus appeared quite often, which is a very satisfying way to give your winnings a boost. While the Tornado feature was difficult to trigger, the rewards are so huge that your patience will definitely pay off. While the entire game itself is awesome, it’s that tempting Tornado feature that will make this an instant hit with online pokies fans.